Community 12th Annual WaccoBB Picnic w/special guests Jared Huffman and Lynda Hopkins; 2:30 Circle! Thread: 12th Annual WaccoBB Picnic w/special guests Jared Huffman and Lynda Hopkins; 2:30 Circle! 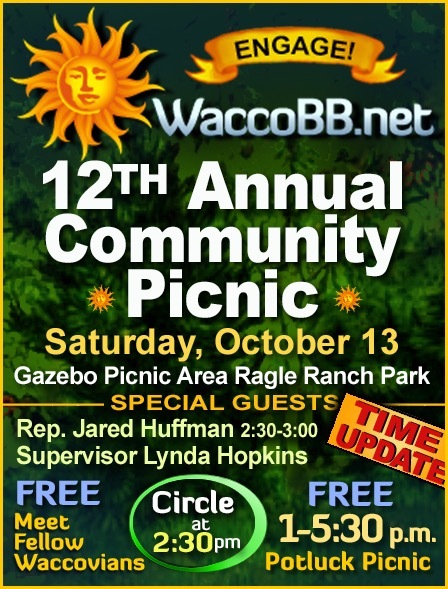 12th Annual WaccoBB Picnic w/special guests Jared Huffman and Lynda Hopkins; 2:30 Circle! I hope you'll join us this Saturday, October 13th, from 1-5: 30 pm for our 12th Annual Community Picnic as we step out from behind our computers to gather once again in the real world and meet each other! The main event will be our amazing Introduction Circle at 2:30 pm (Note Earlier Start Time!) where everybody gets a chance to say a few words ( up to 15 seconds) about anything you'd like. It's sort of a mini-post. This is a great opportunity for everybody to see who you are and put a face to your posts and the posts you read. I am delighted to say that our US Representative, Jared Huffman, and our County Supervisor, Lynda Hopkins will be joining us! Jared will speak at the opening of our circle and then take some questions before leaving to continue his fight to save Democracy! At the end of the circle, Lynda and Sebastopol City Council candidate, Vaughn Higginbotham, and perhaps some Sebastopol City Council members, will be taking questions for those that are interested. Please bring a healthy dish to share. Kids, friends, instruments, and pets on leashes are also welcome. You're also welcome to bring your flyers with a paperweight. We'll have a couple of kegs of Lagunitas beer, despite that beverage's recent notoriety . Help with set up, name tags, keeping the potluck tidy, and cleanup would be most appreciated! Please bring your own picnicware so we can reduce the waste! You are welcome to offer free samples or your services (such as massage or other bodywork, counseling, etc.) along with a tip/gratitude bowl, but without a suggested donation. Last edited by Barry; 10-11-2018 at 02:37 PM. Beautiful poster, Barry! And congratulations on getting Huffman to come again. Last edited by Barry; 10-12-2018 at 08:41 PM. Thanks so much Barry for hosting this great event. It was my first time, so it was special. Great food, wonderful people, and informative speakers. Jared Huffman at WaccoBB Picnic says "gotta begin to get excited"